It’s beginning to look a lot like Christmas! How early do you start your Christmas shopping every year? Are you one of the highly organized people who picks up items throughout the year when you see the perfect gift? Are you the one rushing to the store on Christmas Eve to pick up the last of the gifts? I’d like to say that I’m one of the highly organized gift shoppers but I’m not. I’m not as late as waiting for Christmas Eve though! Gift giving has always been my favorite part of the holidays. I love the feeling when you find that perfect gift that the receiver will love. Now that I have a child of my own, Christmas has taken on a whole new meaning for me! 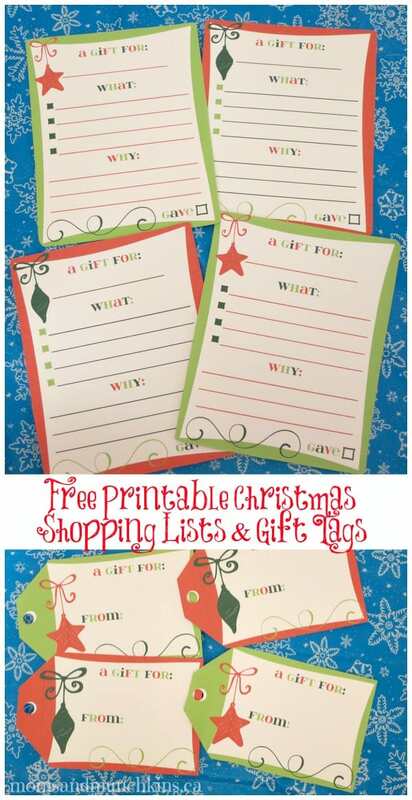 This month’s freebies are Christmas Shopping List cards & gift tags to help you stay organized through the shopping season. These are perfect for kids too as it teaches them about giving to others. Simply print as many cards as you’ll need (one per gift recipient) and write a person’s name at the top of each card. Start brainstorming ideas for what you’d like to buy each person. This will help you stay organized on your Christmas shopping excursions. What I love about these card for kids is the “Why” section. Have them write down why they want to give this person a gift. Are they buying a gift because this person is a special friend? Are they buying a gift because this person did something special for them this year? It’s a great way to get your kids thinking more about the gift giving process and not just on what they want on their own Christmas wishlist. 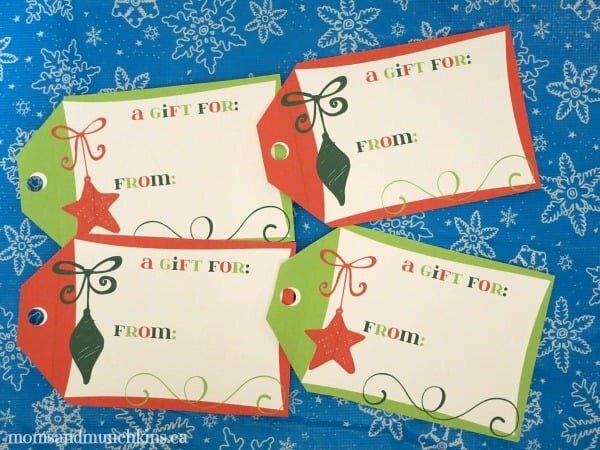 Once the gifts are purchased, this freebie also comes along with gift tags to attach to the gift. A big THANK YOU to Denise with The CreativiDee Workshop for creating the free printable Christmas shopping list cards & gift tags for us. Head on over to her Facebook, Twitter or Pinterest accounts to say HI! She works so hard on each of our monthly printables so be sure to stop by to show her a little love! This freebie is available to Moms & Munchkins monthly newsletter subscribers. You can sign up for free here. As a monthly newsletter subscriber, you’ll have access to all of the past monthly freebies as well! After signing up and confirming your subscription, you’ll be taken to a page with a link to the monthly freebies page along with the password. Please note, that password is case sensitive. To stay updated on the latest ideas for family fun plus freebies, follow along on Facebook, Twitter, Pinterest and Bloglovin’.